This is a guest post by Nicholas Lovell, founder of Gamesbrief, a blog dedicated to the business of games, and author of several books about making money in the games industry and other digital media. Valve has just announced that developers will now be in charge of their own pricing on Steam. They can run sales, offer discounts and promote their games without talking to a Valve representative. This is the beginning of PC games prices drifting downwards, with an endpoint of zero. Here's why. Let's imagine a shoe factory supplying shoes to one small town. Leaving aside the cost of the factory, the land and the equipment, the cost to make a pair of shoes is $1. Every extra pair of shoes made costs an extra dollar. Factory A decides to sell its shoes at $5. An entrepreneur sees that there is an opportunity to make $4 for every $1 he invests in a pair of shoes. He borrows money to build a factory and buy equipment to make shoes. He wants to make sure that he gets some market share, so he decides to sell his shoes for $4, meaning that he only makes $3. His shoes are now 20% cheaper than his rivals. He gets all the customers. So Factory A cuts its prices to stay competitive to $3. The entrepreneur cuts his prices to $2 and so on and so on until, according to Bertrand Competition, prices stabilise when they can no longer afford to make one pair of shoes, the marginal cost, in this case, $1. There is an issue with Bertrand Competition: it excludes the impact of marketing; it assumes that one pair of shoes is as good as another pair of shoes; it doesn't factor in the cost of comparison, or the cost of switching, all of which are real. But what it does say is that the thing that drives the cost of products down, particularly in the case of digital products with low marginal costs, is competition, not piracy. And by removing itself from the pricing process on Steam, Valve has just made its platform hyper-competitive. Free is the dominant price point on mobile platforms. Why? Because the two main players don't care much about making money from the sale of software, or even In-App Purchases (IAPs). The Appstore is less than 1% of Apple's revenue. Apple has become one of the most valuable companies in the world on the strength of making high-margin, well-designed, highly-desirable hardware. One of the things that makes its hardware desirable is that there are over a million apps available for the platform, many of them for free, that extend the capabilities of the phone in a way that Apple might never have imagined. Steve Jobs wanted to enable the free price point for mobile apps because he hypothesised that having a competitive market of entrepreneurs striving to make their software work on his device would drive the desirability of his hardware. Boy, was he right. Google didn't create Android to sell software. It built Android to create an economic moat. Google was dominant in the desktop and makes the majority of its revenue from advertising. It identified the very real threat that Internet usage and search was going to migrate to mobile and it needed to ensure that it did not get left behind. Android was its response. In the case of both iOS and Android, keeping prices high for software would have been in direct opposition to the core businesses of Apple (hardware) and Google (search-related advertising). The only reason that ebooks are not yet free is that Amazon's core business is retail, not hardware. If Amazon believed it could make more money selling Kindles than selling ebooks, ebooks would be free. Console games are not going free because the business model of Sony and Microsoft is to subsidise the hardware and make their money back on the software. In this model, subsidising the hardware and taking the risk of free-upfront games seems too high for incumbents. Which brings me to Steam. The Steambox is a competitor to consoles, created by Valve. It is supposed to provide an out-of-the-box PC gaming experience, although it struggles to compete on either price or on marketing with the consoles. It doesn't seem as if Steam is keen to subsidise the costs of the box, not to the level that Microsoft and Sony are. But what if Steam's USP was thousands or tens of thousands of games for free? What if it competed with consoles by taking the Steve Jobs' approach of an open platform with the price set by developers (and hence likely to tend to free, according to Bertrand Competition). What if Steam *wants* the PC market to go to free because it will be a powerful competitive weapon as it battles the console manufacturers. Steam is also a successful free-to-play channel. 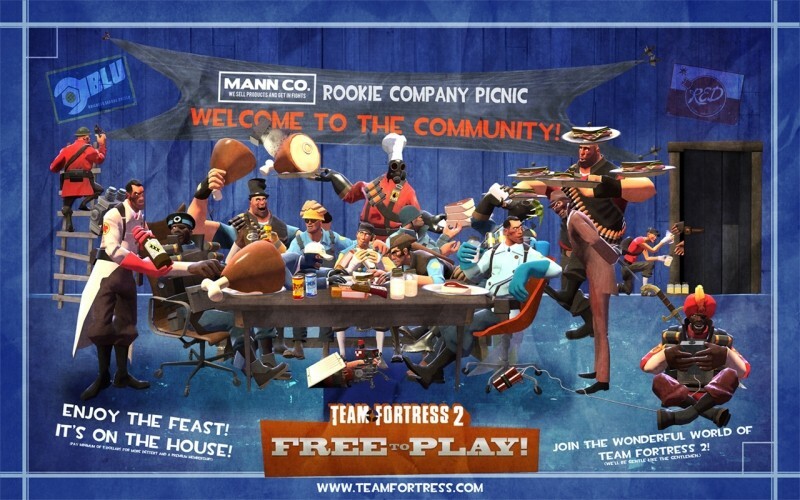 It was an early experimenter with the business model in the West, with Team Fortress 2 staying consistently at the top of its own F2P charts. SuperDataResearch estimated that Team Fortress 2 made $139 million in In-App Purchases in 2013 alone. Other games like Stronghold Kingdoms from independent UK studio Firefly have been consistently high in Steam's F2P charts. (Disclaimer: I have worked on Stronghold Kingdoms since its inception). That doesn't mean I expect Valve to stop supporting paid games, in the same way that I don't expect Apple or Google to do so. I do mean that Valve seems likely to open the market to more developers, to more experimentation and to more price points to see what works for consumers and businesses alike.